Successfully Added HK Warehouse 10 Watt Portable Bluetooth 4.0 Speaker - 360 Degree Sound, 88 LEDs, 5 Lighting Functions, Hands Free, 2300mAh to your Shopping Cart. If you would like to get a speaker with the ability to dazzle then you’re in the right place. 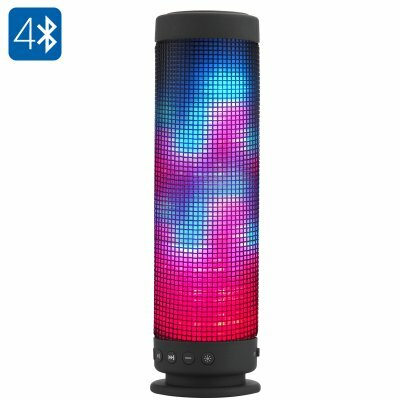 This 10 Watt wireless speaker has a 360 degree sound as well as 88 three color LEDs that can be set to pulsate to the rhythm of your music or gently change to create a relaxing ambiance. With five different kinds of LED visual effects the speaker makes for a great feature in any room to impress your friends with and inject life into any gathering. With two 5 Watt speakers you get a stereo sound quality with good depth and power which results in a rich sound quality. By utilizing Bluetooth 4.0 you can connect phones, tablets or laptops to this speaker and steam music from up to 10 meters away with a stable connection that reduces noise and interference. The power comes from a built in 2300mAh battery, this provides the speaker with up to 8 hours of play time and can be fully recharged in about 2 hours. If your music collection isn’t on a Bluetooth compatible device, then there is an Aux in port as well as Micro SD card slot that will let you add up to 32GB of music, which equates to between 7000 or 8000 songs that works out at around 17 to 18 days of music, if you were to play them non-stop. To switch between the different play modes you simply need to press the ‘M’ button at the base of the speaker and from here you can also adjust the volume or answer calls hands free without even having to remove your Smartphone from your pocket. This powerful Wireless Bluetooth Speaker comes with 12 months warranty. Brought to you by the leader in electronic devices as well as wholesale Bluetooth Speakers, Chinavasion.. Excellent sound from the speakers, matching my more expensive system on my TV. Great selection of colours and patterns.